Last night in the Relay for Life group chat, Julia J. Waugh - Van Drake (Aphroditestarr) announced that one of the leaders of her team, Spirit of Sherwood Forest, had been caught up in a dramatic real life event with a likely tragic ending. "I just got some really bad news. ... One of my RFL team leaders Nikoli (Redmayne) was on Flight 804, the Egypt plane that is missing. ... 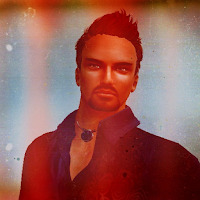 He is my SL brother too, has been a dear friend for years. I just found out from his partner who is headed over to where the families are meeting up" Julia went on to request prayers from the group, For those of you that pray, can I have your prayers sent? I am hoping so so bad that the plane is just off course or out of range, and not completely crashed." The Relayers responded with shock surprise, then statements of sympathy, "Praying for him, all the passengers and crew and their families and friends." "I can only hope that one day, we wont have to suffer anymore." Flight 804 was an EgyptAir Airbus A320 carrying 66 passengers and crew from Paris to Cairo. The plane vanished from radar screens over the eastern Mediterranean, close to halfway between Alexandria the island of Crete. The Greek Defense Minister stated that while the plane had been cruising at 37,000 feet, it made a 90 degree turn to the left and plummeted, making a 360 turn to the right, and lost contact when it was at 10,000 feet. While there were reports of debris near a Greek island, they were later found not to be from the aircraft. While terrorism is suspected, as of the writing of this article, what happened to the plane or the status of those on board is unknown. Nikoli Redmayne was one of about thirty Egyptian passengers. The Airbus A320 has a capacity of about 150, and is described as having "an amazing safety record." Talking with Julia, she had more to say about Nikoli Redmayne (NikoliOasis), "He has been doing (the) Relay with me for seven years now. Our biggest hope is that the planes are just out of reach and not crashed. My heart begs it to be that way. I just can't imagine the worst right now." She told me that he had originally came to Second Life nine years ago under a different avatar, "He got that av a few months back because his old one got hacked. But he has always gone by Nikoli." Julia went on, "He was born and raised Egyptian. ... As a child he had a cancerous tumor that was removed after one round of chemo and has been cancer free since. ... He married his partner that was from the US, so (he) lived here in the states for the last couple of years. He went back to Egypt this past January because of deaths in his family. ... Seven years ago I pulled him into my team with two other friends of mine who have passed recently from cancer. He never wanted to be a captain or a co-captain, so he was just our 'Team Leader.' He was in charge of keeping his eyes open for different events for out team to sign up for. This group is a family, and he was definitely the fire that got all of us moving. We lost our two most inspirational members in the last twelve months to cancer, so he decided to take over the role this year and keep everyone moving in their honor." The news had only recently reached the Spirit of Sherwood team, "I spoke to his husband who is absolutely hysterical, and it was put to me to let our family and team know. Once that was done we agreed that it should be asked in the RFL group for prayers." Details are still coming in on what happened to the airliner, but it is appearing that this man who survived cancer and has spend years helping to fight it may have met his end to a different enemy. Update: Shortly after this article was written, aircraft debris, including seats, luggage, and human remains, were found in the sea in the eastern part of the search area.